US equities built notable gains across much of the day, sp +13pts @ 2066. The two leaders - Trans/R2K, both settled higher by a rather significant 1.2%. Dow broke a new historic high of 17897. 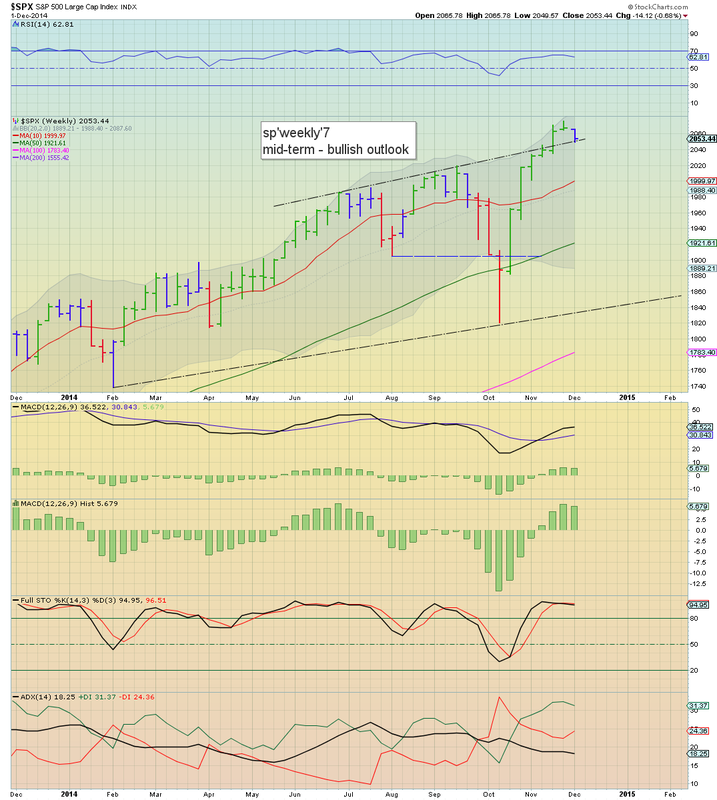 With the renewed gains, near term outlook is 'mixed'. 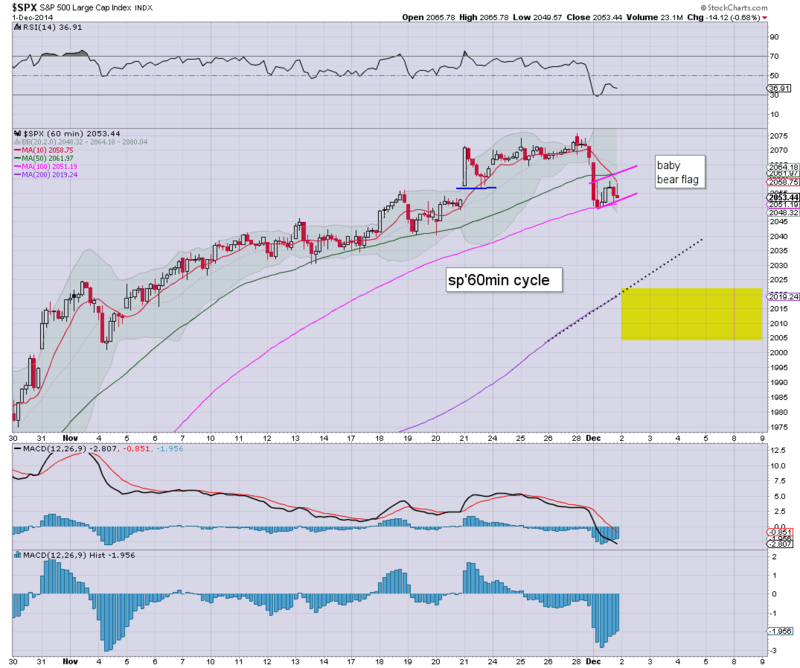 *price structure on the smaller 15/60min cycles remains a bear flag, first 'soft target' would be sp'2020/15... but clearly, that is more likely next week. In many ways, with the hyper-ramp from sp'1820 that we've seen, even retraces are more often about trading sideways, than actual price declines. It is thoroughly depressing, and I'll have no part in trying to trade what are (at best) minor retraces. Well, maybe we'll get another wave lower tomorrow, but regardless, today has been just another disappointing day for those in bear land. Notable strength: BAC, +2.0%, and I'll very likely be referring to that one a great deal across next year. 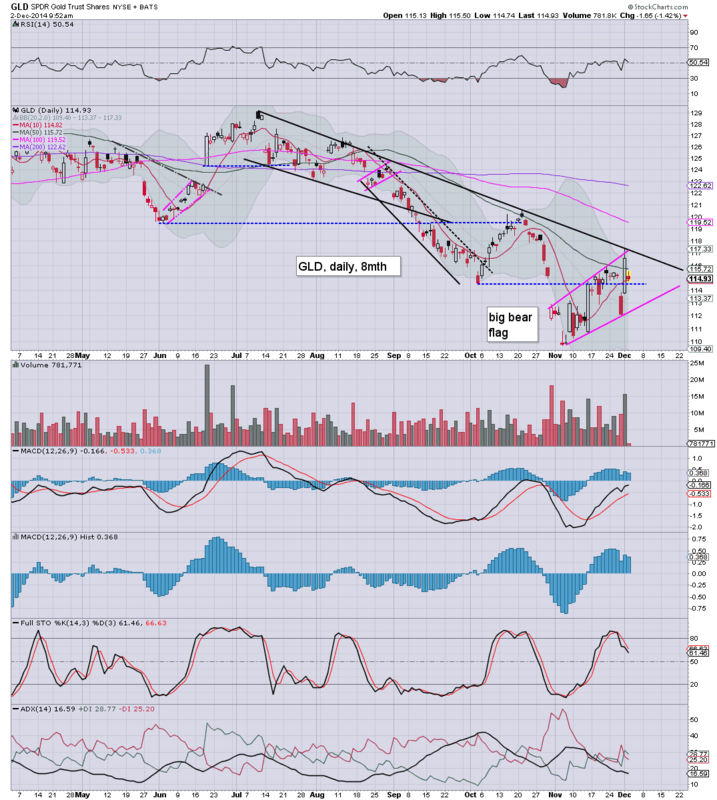 Weakness.. the miner ETF of GDX -3.8%... naturally.. with the metals back on the slide. 3.28pm. .. a touch of weakness.. we ARE still due to rollover, but really, the waiting is real tedious. *a lot of things are due tomorrow, not least ADP jobs and Fed beige book, but more on that.. after the close. 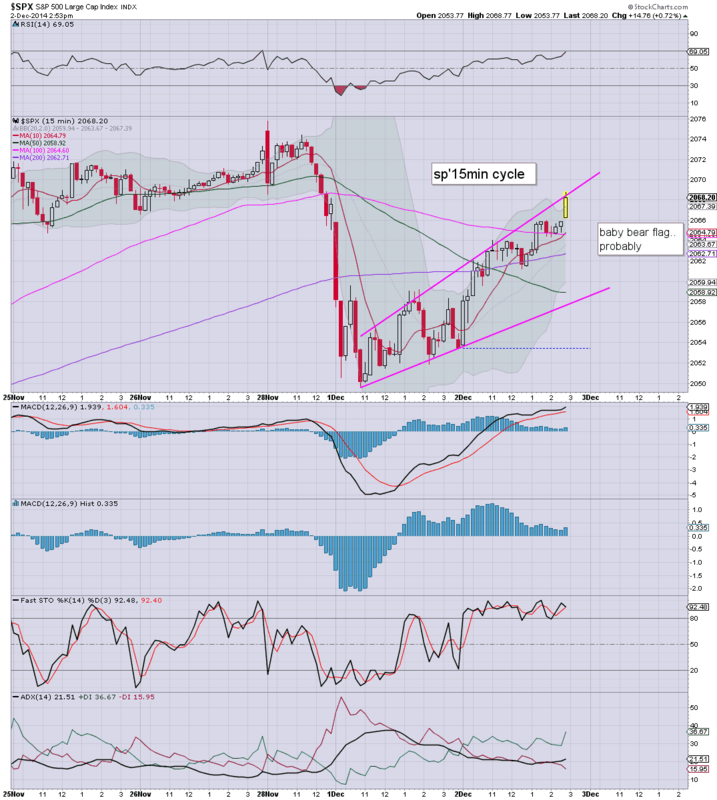 Oil -3.2%.... sub $60 by year end... very viable.. before the first decent chance of a $15/20 bounce. The smaller 5/15min equity cycles are arguably maxed out, at sp'2065, with VIX -7% in the 13.10s. With the USD holding gains of 0.8%, commodities remain under pressure. Gold -$14, whilst Oil is -2.3%. 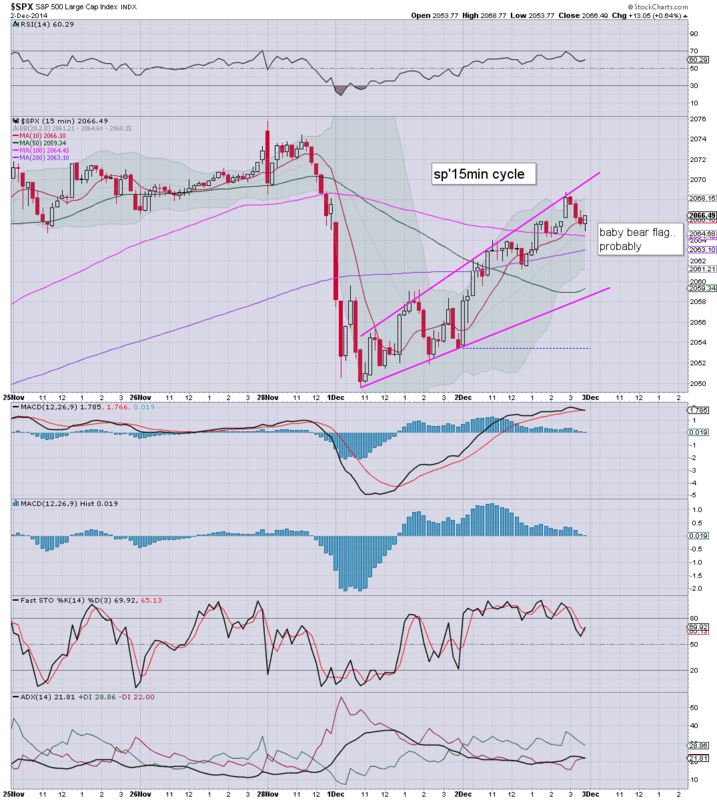 *yes, the bear flag is borderline right now. Need a break lower of 7-10pts by the close.. Overall.. its getting a bit tedious again, and that is just one of the reasons I have zero interest in trying to trade the smaller down cycles. To me.. seems a waste of time.. not least whilst the broader trends are higher. 2.32pm.. Market stuck.... still set to break lower into the close. 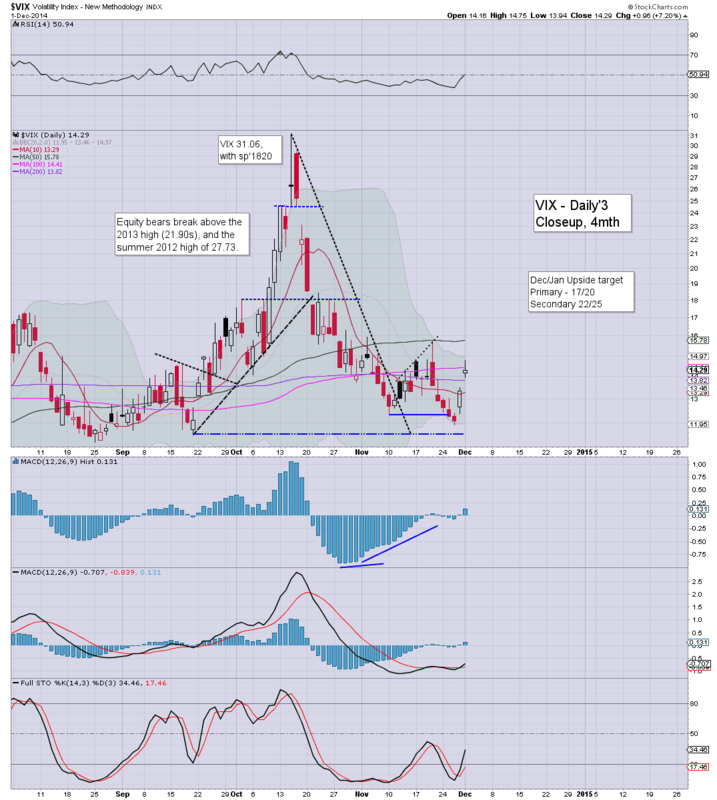 The one aspect completely failing to offer any concern.. the VIX,...-8% @ 13.12. 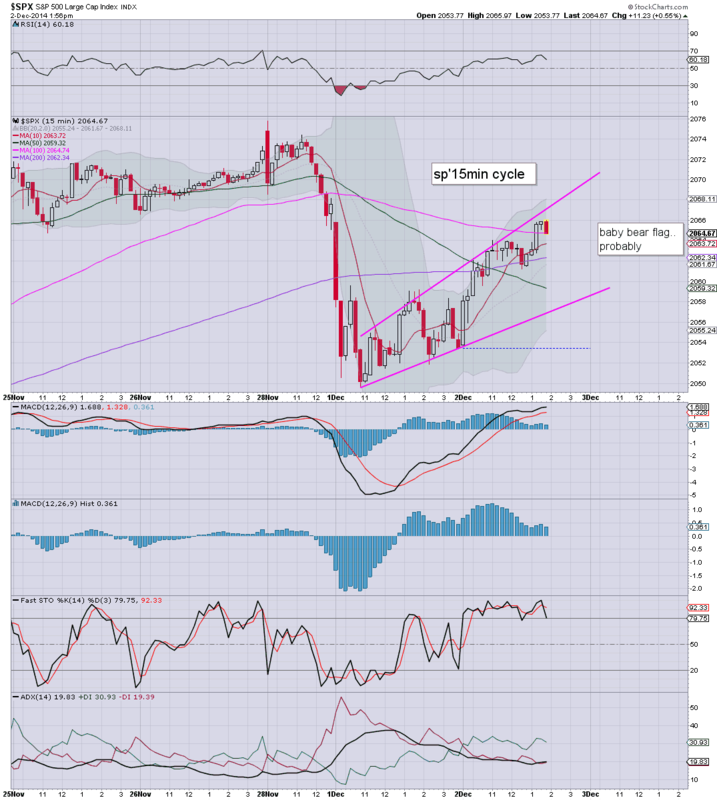 US equities are still holding gains, with more significant upside in the Trans/R2K. 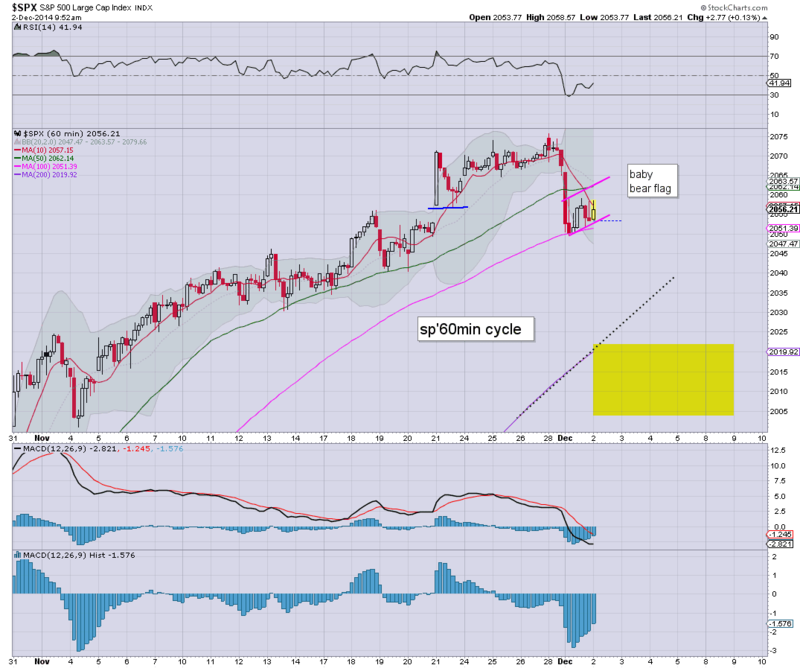 Price structure remains a bear flag, with viable downside to sp'2020/15 in the near term. Metals remain weak, Gold -$12, whilst Oil is -2.0%. 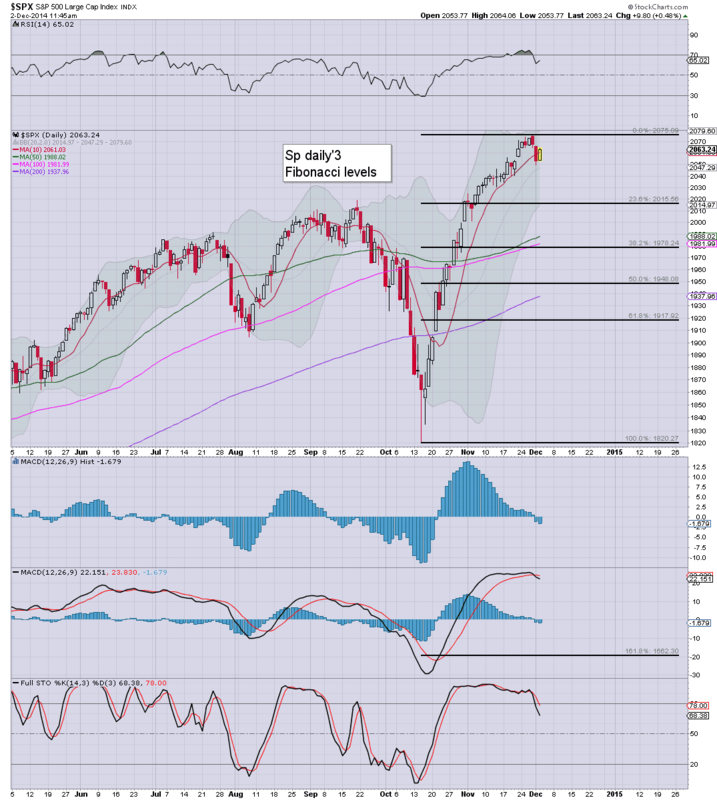 If you believe sp'2075 was a near term top.. then the fib chart offers high chance of 2015... if not 1980. However, the 50dma is rising, and that will be damn tough to break. In any case... sub'1900s are impossibly out of reach. 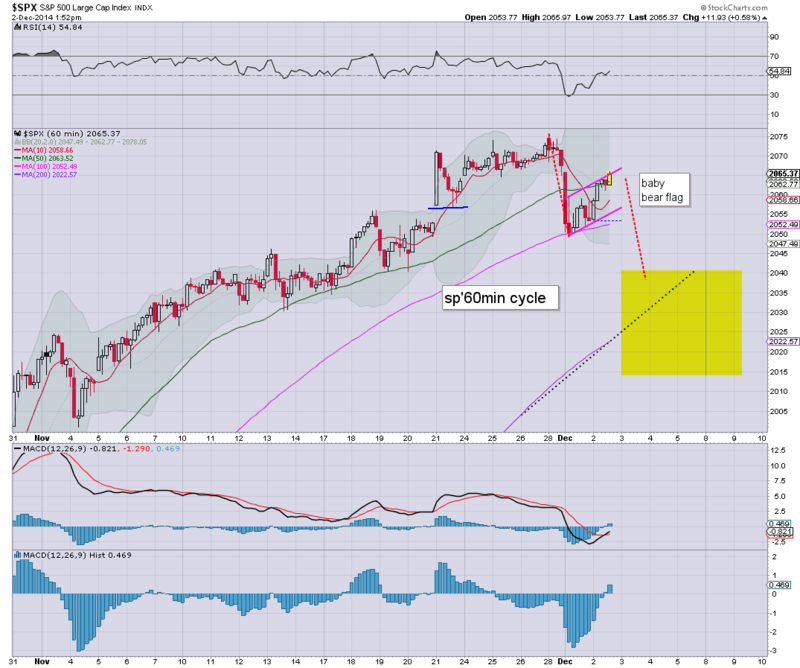 The sp'2100s remain a valid target.. whether late Dec' or January.. it should make no difference. US equities are holding gains.. but it is the typical turn time of 11am.. and Mr Market is certainly vulnerable to cooling back lower for the rest of today. With a higher USD, Gold is under pressure, -$12, whilst Oil is -2.5%. Suffice to say, if bears can turn the indexes fractionally red by 1pm... it'll make for an interesting afternoon. VIX is so far in melt mode, -6% in the 13.30s. Despite opening moderately higher, US equities look highly prone to turning lower as the day proceeds. With the USD +0.7%, commodities are under pressure, Gold -$17, with Oil back on the slide, -3.2%. *action in the metals (and miners).. along with Oil remains pretty wild... as usual.. both are closely tied to currency changes. So.. indexes are a little higher.. but really.. we look set to break a fair bit lower.. later today. Good morning. Futures are moderately higher, sp +4pts, we're set to open at 2057. Price structure remains a bear flag on the hourly chart, and there remains fair opportunity for the bears to knock the market down to the 2045/40 zone later today. Good wishes for Tuesday trading! The final month of the year began with some equity weakness, sp -14pts @ 2053. 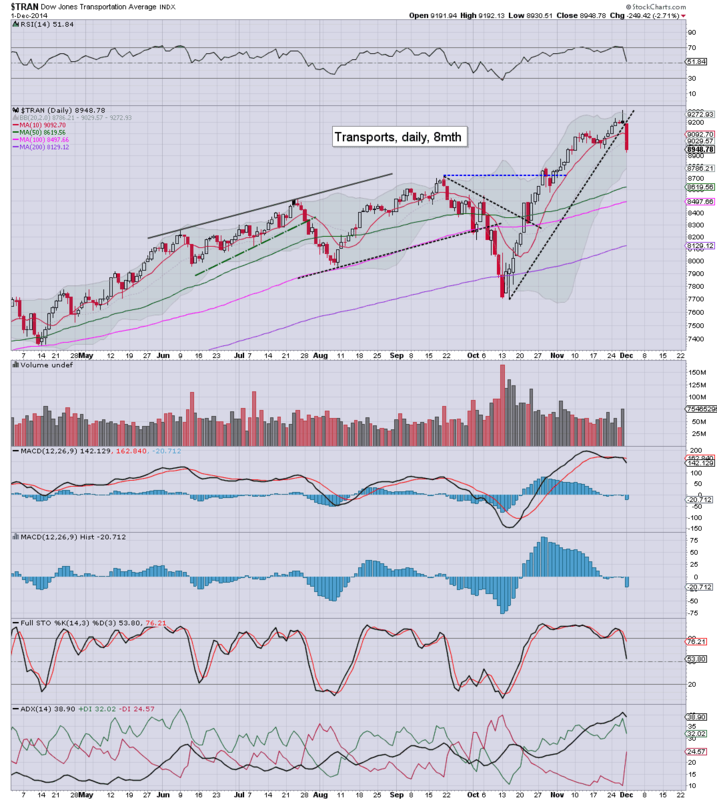 Having ramped from 1820 to 2075, this market is unquestionably still due at least some degree of retrace. Best case for the bears.. a move to 2020/00.. before the 2100s. So, a moderate decline for the broader market, but with a pretty significant daily decline in the Trans. No doubt, the bounce in Oil prices put downward pressure on this sector today. 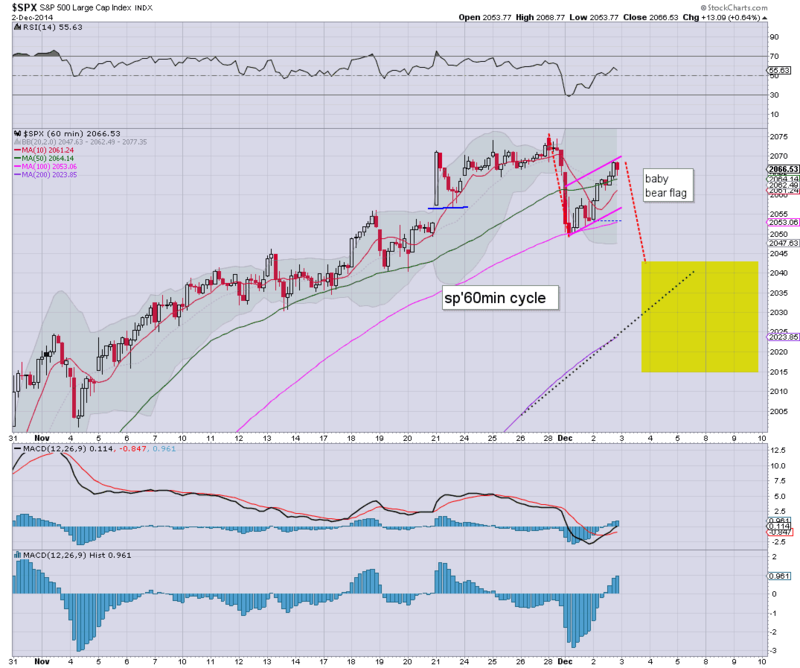 In terms of a retrace, best guess remains sp'2020/00. A sustained period of trading under the giant 2000 threshold looks unlikely. After all, the BoJ will be out there buying. We've not forgotton about them already.. have we? Oh noes.. a blue candle! 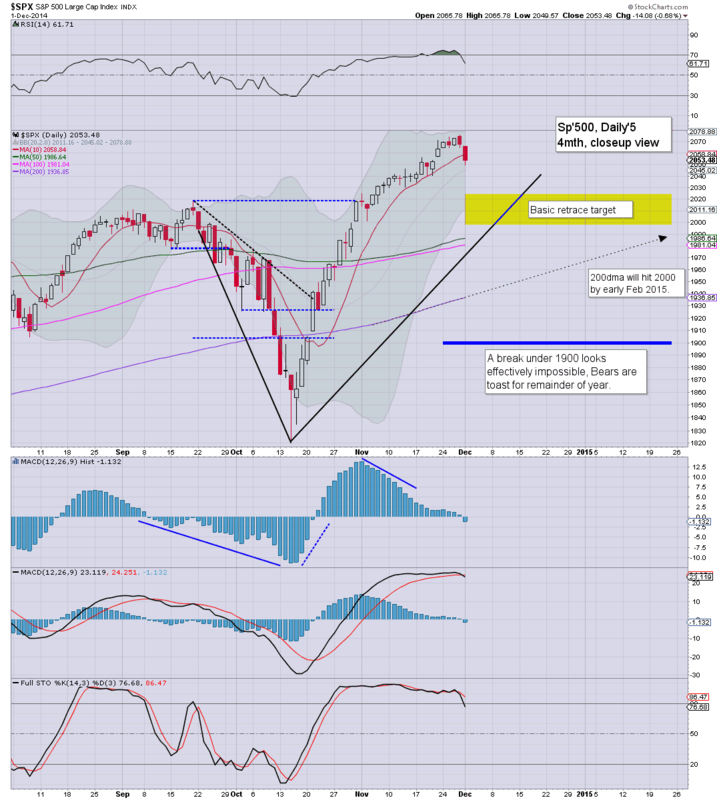 The opening weekly 'rainbow' candle is blue.. and with the 10MA around sp'2000... it makes for a natural retrace target... but more viable next week. 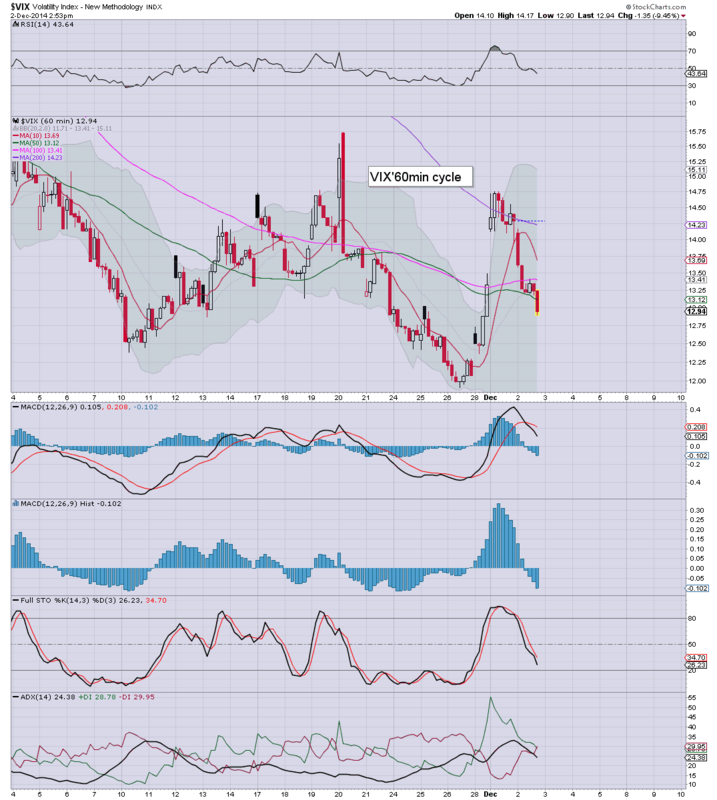 A look at the VIX.. which settled higher by a moderate 7.2% @ 14.29. At best, a move into the 17-20 zone, but considering the broader hyper-ramp from mid October, a sustained move into the 20s looks highly unlikely. The only data of note is construction spending. *there are two fed officials on the loose, and as today showed, market remains particularly attentive to any mention of interest rate hikes.